My passion is boxing and I give everything for my sport. In the ring, out running or for strength training: a perfectly fitting sports bra that gives you the support you need, without being restrictive is absolutely essential. I found the right support in Anita Active. The sports bra sits barely noticeable on the skin, yet still offers high backing. There is no slipping whatsoever, especially during boxing matches. As a brand ambassador I am convinced: Sports bras from Anita active are simply UNBEATABLE. My true dream is to be a successful boxer in The States. A victory over Claressa Shields would lead to even more great things to come in America and I have been preparing steadfast in hopes of a great win on April 13th! Is Claressa Shields your dream opponent? This fight is definitely the most important of my athletic career. 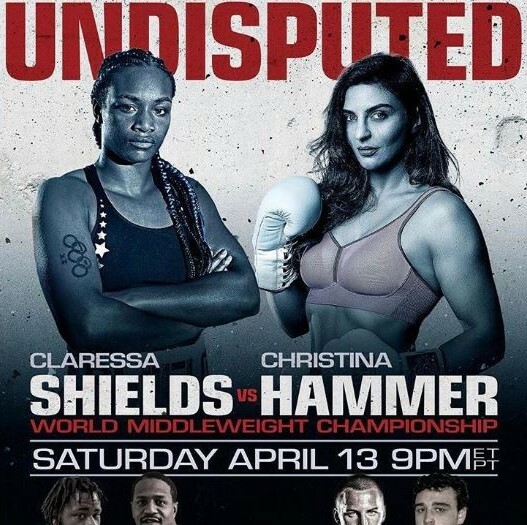 Claressa Shields is a very special opponent. We are very different, but also both have strong personalities and have been known to fight well and fight to win. I have studied Shields’ fighting techniques since her Olympic days and know her weaknesses and what it will take to defeat her. Are you prepared as a boxer specifically targeted at the respective opponent? Yes, I prepare for each fight and each opponent individually. My team and I have given specific attention to this upcoming Super Fight vs. Shields. I know Claressa wants to keep her belts, but belts do not necessarily bring experience and experience is where I will have the advantage in the ring. What’s the first thing you treat yourself to after a fight? Smile … z. For example, after my last fight in the US, I remember, there was a burger shop around the corner and me and my brother we just ran to the burger shop and ordered 5 cheeseburgers. Terrific! I liked it very much. And in the weeks after the fight, my personal life doesn’t have to take a back seat to my fighting life. I get to go out with my friends and enjoy quality family time, until my next fight prep where I will be 100% committed to securing a victory, although I have always been known to stay hungry in the interim. What goals will come after the fight against Claressa Schields? No goals are currently to be mentioned until after I have taken the four belts from Claressa Shields back to my native land of Germany!